I’ve been asking for stories of inserimento lately–see submission guidelines here. 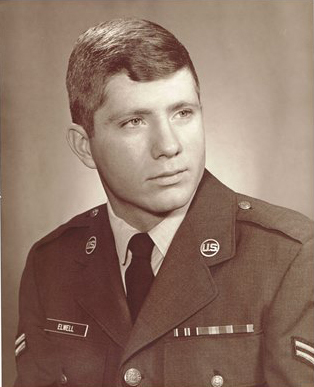 Doug Elwell answered the call with the following Vietnam-era essay. At the end of a long day of being poked and prodded in places one should never have to be poked and prodded, those of us who were deemed fit to get our whole asses shot off for Uncle Sam stood before some kind of officer, raised our right hands and swore to uphold and defend the Constitution from all enemies of the United States, foreign and domestic. Following our swearing-in we were assigned to a group and were ordered to assemble at the Y.M.C.A. the next day to leave for Lackland A.F.B. basic training. Frankly, I’m embarrassed to send you off to my Air Force. The sergeant paused then pleaded. Try to remember that each of you are now the property of the United States Air Force and are expected to conduct yourselves in a way that is a credit to the Air Force. Don’t be any more stupid than you already are until you get to Lackland. Save it up girls; you’ll have plenty of opportunities to show how stupid you are when you get there. When he finished, he was at the boarding gate. Motioning over his shoulder, he said now get your sorry asses on that plane. We got our sorry asses on that plane headed for San Antonio via Shreveport. Our sorry asses touched down in San Antonio on June 11, 1966 around two-thirty in the morning. We were met by a sergeant of some kind I didn’t know standing in green fatigues next to an Air Force blue school bus. Sgt. McFarland stood by the door as we boarded. He looked as tough as a piece of charcoal broiled gristle. He was at least in his mid-forties, probably older, short and thick, not fat, from his shoulders to his boots. The first thing I noticed about him was what I couldn’t see. He had no neck. His head sat on his shoulders as if it had once been broken off and rolled into a dark corner and disappeared, so they just sat his head back on his shoulders. That’s what Elmer McFarland looked like. From the look of the wear and tear on his face, I suspected getting his head and neck knocked off sometime in the distant past was probably what happened. He had the look of a man who had been around the block a number of times and appeared to have lived to tell about it, although in the dark I wasn’t sure. I was fairly sure though that if I had to choose only one man to be my partner in a bar fight, McFarland would be my first pick. A large, lighted sign like the ones at the entrances to trailer parks sat under an old F-100 mounted on a pylon. It greeted us as we were waved through the main gate. The bus rumbled slowly through a maze of dimly lit streets turning left then right then left again. I lost all sense of direction. I would soon realize arriving in the middle of the night in a strange place was the Air Force’s first step in ripping us away from the civilian life we had left. Presently brakes screeched to a halt in front of a mess hall lit up in the night like the painting of Hopper’s Nighthawks. I looked at my watch—three am. It was brutally hot and muggy. McFarland ushered us in where we had our first Air Force breakfast. Large fans on floor stands roared from each corner of the hall shoving the hot, muggy air around. I picked up a tray, a plate, knife and fork and a couple paper napkins that were curling at the edges, turning yellow like a newspaper left on the driveway. As I inched down the line I noticed a tall black cook standing over a large griddle at the far end, scrambling eggs and frying bacon while beads of sweat dripped off his arms and nose onto the eggs. Before I got to the egg pan in the steamer, I picked up a couple pieces of toast and a half pint of orange juice thinking there was less chance of them being seasoned with the cook’s piquant Diaphoresis Vinaigrette than were the eggs. About ten minutes after entering the mess hall, McFarland stood and announced we were to be back on the bus in five minutes. It trundled on into the night through another tortuous series of left and right turns until it screeched to another halt in front of a darkened barracks. He led us inside and said to find a bunk, get some sleep. The lights went out. It was three-thirty. At four-thirty, the lights came on. McFarland paced the center of the bay rousting everyone. We stood at the foot of our bunks rubbing red, swollen eyes and scratching our crotches while he launched into his welcoming speech. You and me got jobs to do. You do what you’re told. If you don’t, I’ll be climbing up your sorry asses twenty four hours a day. (I had heard “sorry asses” so often I thought it might be a rank. Later I learned it was—Airman Basic) Anyway he went on. Last night you heard some sergeants screaming, calling their men names and so on. I don’t believe in that. We got to get through as best we can with the least amount of aggravations—don’t like no aggravations. He stopped near the door to the latrine and faced us. One more little thing. I don’t like debriss around my barracks. He made the “ess” sound at the end of debris. I didn’t volunteer anything. Maybe another time when it’s just the two of us in the day room discussing Proust over brandy and cigars I’ll mention the s in debris is silent. At any rate, he began pacing up and down the center aisle looking at the floor as if searching. If you see any debriss, pick it up. He shuddered. Debriss is someone else’s disgusting filth and if it accumulates—especially chewing gum wrappers and cigarette butts—if it accumulates—cigarette butts are the worst—stink and when they stink—germs in the butts—debriss multiplies—maggots—oh—candy wrappers—don’t want to live with no filthy maggots from stinkin’—debriss. It’s those godless commies—spreadin’ debriss around in the middle of the night to weaken us—drag us down to the godless gutters of filth they live in. Beads of perspiration dotted his forehead. He shouted, this barracks will not be a filthy godless gutter. He shuddered, brushed his arms as if to rid them of debriss. He stood still, back to us, slapping at maggots in his ears. I wished I had some steel bearings to give him to roll around in his hand like Humphrey Bogart in Caine Mutiny. But I didn’t. Excuse me. He disappeared into the latrine. We looked at each other in silence—some resumed scratching their crotches, then the sound of running water. When it stopped, we heard paper towels cranking out of a dispenser on the wall. He emerged with his hands full of them, vigorously drying his arms and wiping his ears. He threw the towels into the trash, straightened and ran his thumbs around the inside of his pant waist then dismissed us. At five a loudspeaker attached to a nearby pole erupted with a series of loud scratches from a worn out record followed by a blaring trumpet blowing Reveille. A few minutes later we formed up outside and started our day. The thrumming routine of basic training was under way. Doug Elwell grew up on the prairie of rural east central Illinois. His stories feature the characters, lore, and culture of that region. He explores the depth and richness of the inner lives of its people and communities. He is an occasional contributor to The Australia Times. His work has also appeared in The Oakland Independent, Ignite Your Passion: Kindle Your Inner Spark, True Stories Well Told, Every Writer’s Resource, Writers Grapevine, Ruminate and Midwestern Gothic literary journal. He has a Kindle novel, Charlie, available from the War Writer’s Campaign at www.warwriterscampaign.org. Proceeds from purchases go directly to the campaign, a non-profit that helps re-integrate veterans into society following their deployments. Doug can be contacted via email at: djelwell@mchsi.com. This entry was posted in Guest writer, Writing prompt. Bookmark the permalink. I love this and will look for your novel, Doug. This memoir author makes great use of repetition, and graphic description using the senses. Don’t you want to read more? Veterans are a source of great stories, if you can get them to tell. Maybe basic training is a safe place to begin. Deborah, thanks for liking my piece well enough to re-blog it. As far as more stories go, I have written a couple including the e-book “Charlie”. I’ve written very little about my service time because there are others whose stories are much more significant than mine.